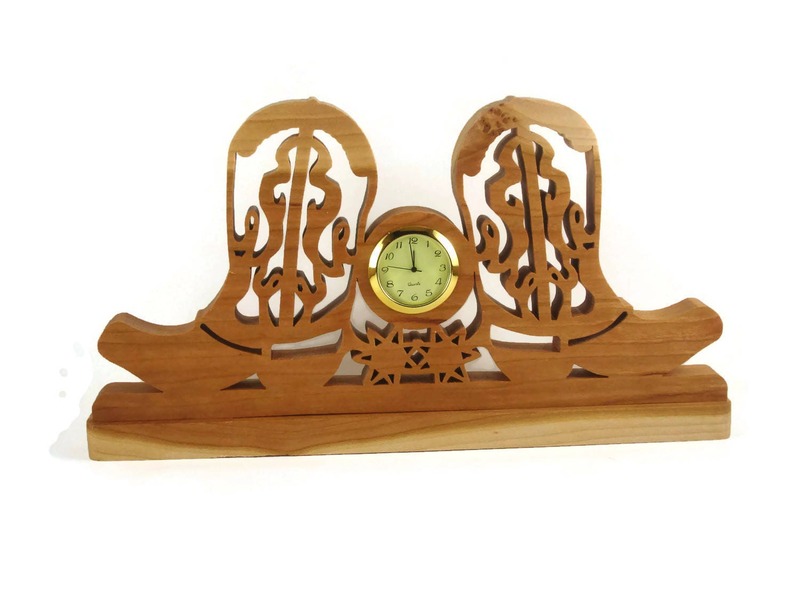 Decorate your desk with this western style cowboy boot mini desk clock. 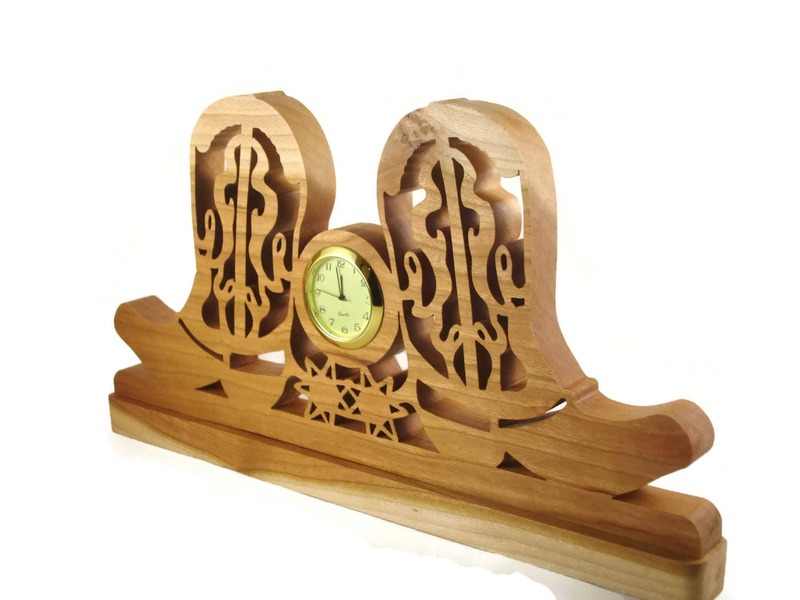 This clock features a decorative pair of cowboy boots with spurs with a clock separating the pair of boots at the spurs. 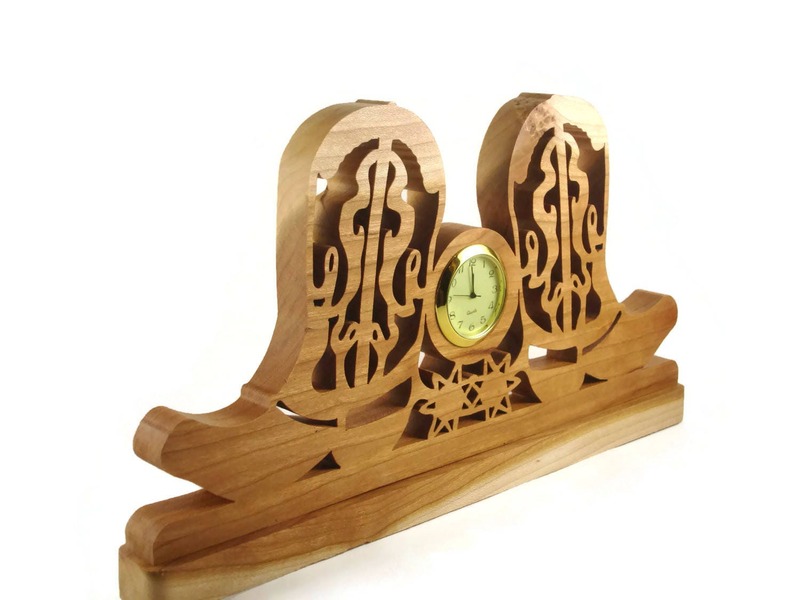 The 1/2 inch thick hand selected Cherry lumber has the perfect grain patterns for this western style clock. The clock insert used is a 1-7/16 inch Quartz with Arabic numbers on a white face and a gold plated bezel. The clock insert is friction fitted into a 1/4 inch deep recessed cut out. 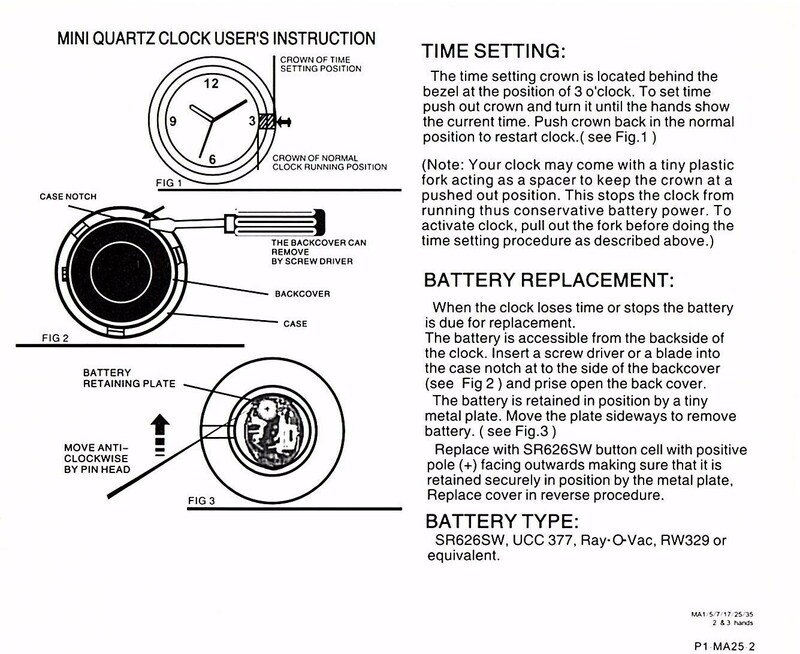 Clock is new with battery installed and ready to be activated ( see activation instructions below). The Cherry lumber was sanded smooth and had my special blend of bees wax and mineral oil finish applied, which gives the wood a very soft silky smooth feel as well as protects this beautiful timepiece for many years of enjoyment. I find it easier to insert it on an angle with the left side ( opposite of the setting pin ) pushed into the recessed part and then push toward the side while lowering the right side into the recessed area. 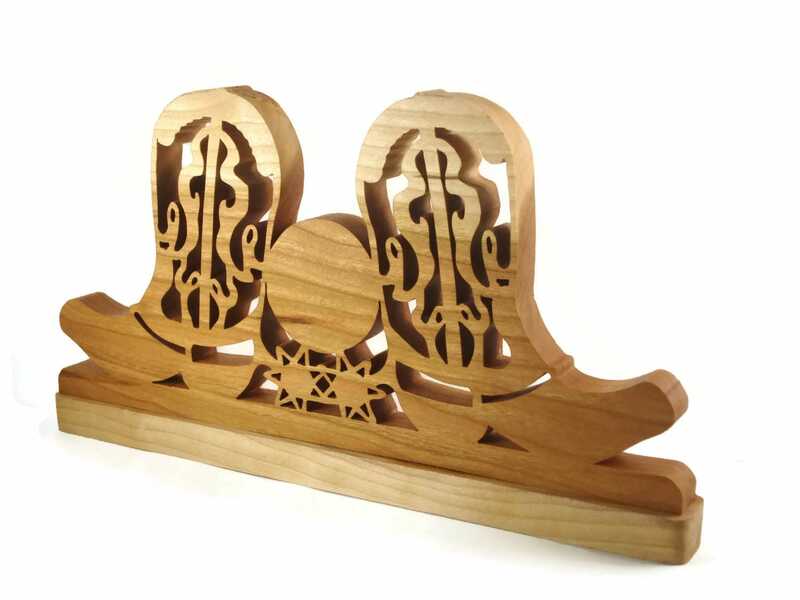 Custom / Personalized Order Request MUST be discussed BEFORE you purchase to be sure we can agree on design work and Additional pricing.. Also NO RETURNS, or REFUNDS on Custom / Personalized Items. I try to ship items within two business days. 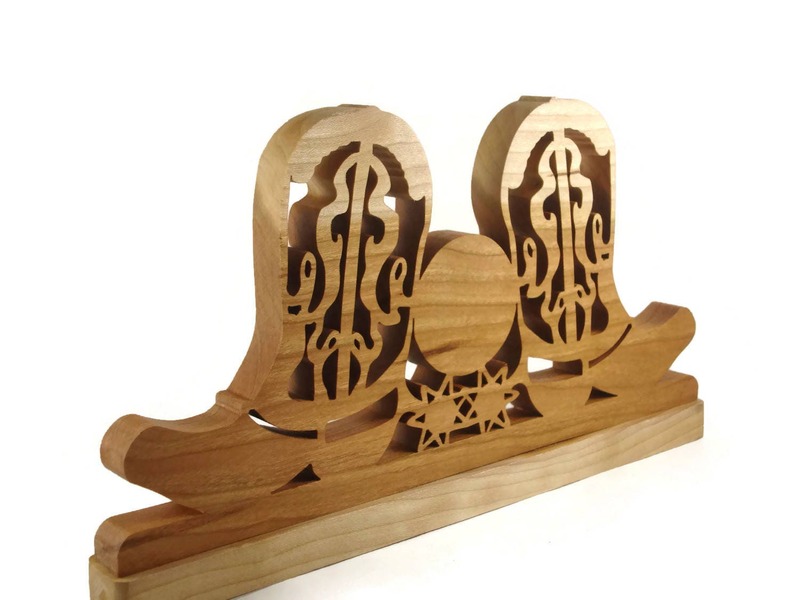 I ship most items via USPS First Class Mail for both quick delivery and careful handling of the package. I usually ship the larger and heavier items by USPS Priority - I insure the most expensive items, at my cost. Any orders shipped out of the U.S. can be subject to import customs duties, taxes and brokerage fees which are payable by the recipient (customer) on delivery. Unfortunately, I can't tell in advance what these charges will be as they are established by your own country's customs department. You are responsible and legally obliged to pay any and all import duties, taxes and/or brokerage charges that are incurred on the package you receive. It is your full responsibility to verify the customs, duties charges and procedures prior to placing your order. You can find more details on these duties and taxes from your country's Revenue Website. In the UK it is at the official HM Revenue and Customs Website. I want you to be 100 % satisfied. If you receive an item that is not what you expected, you may return it for a full refund if postmarked within seven (7) days after date of tracking number saying item was delivered, excluding the shipping charges both ways. For products that arrive damaged or disassembled I require that the buyer send me a picture of the damaged product as well as the damaged packaging within 72 hours. This is necessary for claim purposes with the Post Office as well as for a replacement. After this information is received I will send out a replacement as soon as possible.